Apple enthusiasts, Apple’s brand new wearable is coming to the market in mere months (presumably), looking exquisite as always, and sporting a plethora of new, unique features. This is certainly a great time to be alive – the series 4 is the long-anticipated pinnacle of Apple’s craftsmanship in the “wearable” department. We’re going to discuss the rumours regarding the release date, design, specifications, new features, tech specs, and various other things that concern the Apple watch 4. Now, the Apple Watch 3 made quite a boom when it came out in September last year, and it’s important to note that emerged on the market only ten days after the official announcement. The series 1 and 2 came on September 2016 while the first generation came out in April 2015. There are high chances that Apple Watch 4 is coming out this autumn, and what gives credibility to this statement is the sheer fact that all generations of the Apple watch revolved around September (apart from the first generation – April). Another reason why we believe Apple watch 4 is coming in autumn is the fact that new iPhones are also scheduled for this part of the year. A certain number of Apple bands were promptly removed from August Apple lineup, which only suggests that new straps for Apple watches are also coming. If we’re to believe Consomac’s report (filed in August 20 this year), we should be expecting 6 new Apple watch models (as opposed to 8 apple watches that came out in 2017). Last year the watches came out in aluminium, steel, as well as ceramic, although Consomac believes that this time the ceramic option might not be available. Read Also: if you need best fitness trackers to monitor your activity without apple watch 4, then you can read our latest guide “best waterproof fitness trackers review with comparison“. Design – what’s old, what’s new? 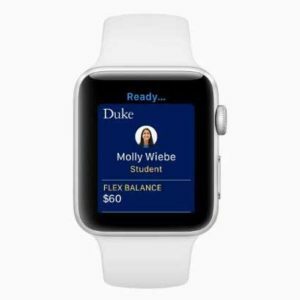 Apple watches in generations 1 to 3 all feature the same outlook, minor cosmetic changes aside. 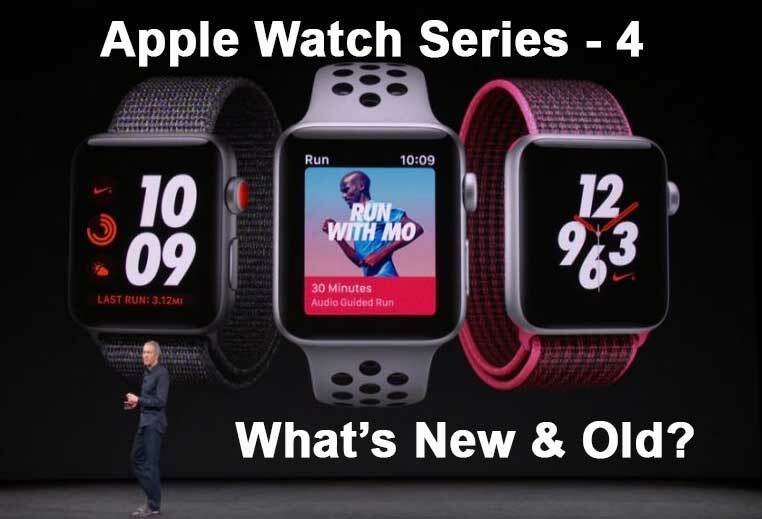 Now, the year of 2017 was especially important for Apple watches, as the brand introduced cellular connectivity, which led us to believe that Apple will change the overall design of their watch this time. The two main reasons why most people believe the Apple Watch 4 will look different is due to a 15% larger display and new bands. The larger display owes thanks to reduced bezels while the new bands (complemented with the all-new modular design) will make the watch appear lightweight and thinner. Apple product analysts, enthusiasts, and people with loads of free time have speculated all manners of things regarding the Apple Watch 4. Some claims were surrealistic to say the least, but among the most plausible ones is the one that regards the screen size. Namely, one of the most popular Apple analysts Ming-Chi Kuo speculates that the screen of the Apple Watch 4 will be 15% larger. Furthering his prediction to the enhanced battery lifetime, Kuo believes that Apple will either enlarge the chassis or make the edge bezels smaller. Additionally, Ming-Chi states that the new design will be sharp, “more trendy” in appearance. Solid-state buttons are surely a big step forward – this feature will be more user friendly, and is likely to appeal to most apple enthusiasts. The regular hardware buttons will be replaced with touch sensitive haptic buttons – this rumour is based on Fast Company’s report which cites the source with direct knowledge of Apple’s plans. This kind of buttons is also present with iPhones 7 & 8. Notice that these phones feature a home button where you don’t need to actually click it – the technology will recognize the fingertip’s proximity digitally, simulating the click with haptic vibrations. It’s pretty neat that users will be able to adjust the sensitivity of buttons, providing a more personalized experience. This information was provided by “Fast Company” report. The haptic buttons are the first brand-new feature of Apple Watch 4 – they’ll replace the analogue hardware with fingertip sensors. In essence, the basic layout of the buttons will remain the same as with the previous watch, only they won’t “click” like before, rather they’ll react and vibrate under your fingertips (Apple calls this “Taptic Engine”). Read if you interested: If you want to know the details about Apple Watch Series 3, then you can take a look into “Apple watch series 3 review and buyer’s guide“. One of the least appealing rumors regarding the Apple Watch 4 is the completely new round-face design. It is to resemble a traditional wristwatch, which might appeal to old school people, but aren’t we all into apple since we like bleeding-edge tech? There’s another problem with round watches – the text will inevitably get squeezed at certain points (top & bottom), and most of the focus will be directed toward the centre. The reason why Apple considers this idea is because of more economical space usage due to easier projection of pixels. Apple’s round-face patent suggests “A display may have an array of pixels”. The round face will supposedly look exactly akin to the face of a regular, old-school stop-watch, which also means that certain features will have to be rearranged and repositioned. It’s obvious enough that Apple didn’t want to just change the design – their technology has advanced to a completely new level ever since last year’s Apple Watch 3, and it’s safe to say that you can expect quite a lot in terms of new additions and improvements. New watch also means new straps and bands, at least that was the case with every Apple Watch release so far. Certain bands have been missing in analyst reports, leading us to believe that bands like Sport Loop, Classic Buckle, Sport Band, as well as Woven Nylon will be out of stock (mainly based on Macrumors). So what is it that Apple is preparing for us this time? Will there be completely new bands and straps, or will those “missing/out-of-stock” models be re-invented? From what we’ve gathered, new bands intend to offer more than simple means of strapping your Apple Watch 4 to a wrist. Health monitoring functions, improved Watch Battery lifetime, and various other improvements are the least you should be expecting from the new addition of the Watch. Now, among the most dominant rumours regarding the new Apple Watch bands includes a brand-new multi-function band which is intended to sell with Apple Watch 4. The idea is quite simple in nature – certain technologies integrated within the earlier watch models were “moved” from the watch to the smart bands. This way you can customize the watch with features you want, leaving those with lesser values out of the picture. Additionally, “moving” those technologies also means that there’s more space for new ones onboard, such as improving the battery lifetime, the camera, and so on. New bands will feature components that are tightly linked to the all-new modular design, which means that each link will perform a corresponding, yet separate function. Swapping the models as per your own requirements will be easier than ever. Read Also: How to understand all metrics and stats related to waterproof fitness tracker. Modular straps will, presumably, be able to be used for monitoring your health. Analyst reports from June 2018 indicate that Apple considered manufacturing a special band (more of a cuff, actually) that aims to measure and monitor the blood pressure of the wearer. Apple has sharpened its focus on health-related products, but they were forced to reconsider including watch sensors, mainly due to FDA approval issues – even though using, re-inventing, and improving these sensors to the point where they wouldn’t be “too unhealthy” is and was possible, “it would hold Apple back from innovating too much” as the process would take too much time. New health bands would be smart and interchangeable, allowing you to use the health-related features at your whim. What’s more, there were rumors regarding the glucose monitoring features/bands, but it’s uncertain whether they will be introduced with the release of the Apple watch 4, or at some later point. Several reports from July and August this year suggest that a team of specialized developers are to join Apple’s staff, which further bolsters the rumours about health-monitoring bands. Read if you wanna know more: If you are confused about “Are fitness trackers worth it? Is it waste of money?” then you can read our post about it. Rumours indicate one of the two things regarding the Apple Watch 4 battery – it will either be stronger on its own, or there will be a strap that will improve it (while it’s active, of course). The latter is more likely to happen, though, as there was an uncovered Apple patent which refers to “auxiliary electronic device”. On top of that, words like “wearable” and “attachable” were used to describe it in the teaser, which means that it is most likely that they’re working on a strap or a band that will improve the battery’s power, lifetime, or both. If we take a look back at Apple Watch from the series 3, we notice that its battery can withstand up to eighteen full hours, although the overall battery lifetime varies depending on how you use it Apple guarantees, however, that you’ll be able to talk for up to three hours while connected to the iPhone with Bluetooth. Audio playback boasted 10 hours of playback, and charge-time required approximately 2 hours to get back to 100%. We can only hazard a guess that the overall battery lifetime of Apple Watch 4 will be improved from 18 to at least 20 hours of all-day battery life. On the other hand, the calls might be improved from 3 to 5, or the audio playback from 10 to 12 hours. There are no solid rumours regarding this matter, though, only speculations. Apple’s “Display module & System Applications” patent was published back in the May of 2017, and it refers to a plain image of a wearable, most likely the design of the new watch. Apart from the obvious (round face), this patent shows that Apple intends to change/improve the display. There were little rumours regarding this topic, and the most we can offer are half-hearted speculations, since the patent refers to “Watch Design A”, implying that there are more than one designs in question. So far so good, Apple Watch 4 looks like it’s going to be a whole lot of fun. With numerous improvements in performance and aesthetics, it’s time to get down to new Apple Watch 4 hardware settings and features. Simply put, the “gesture controls” are to be used based on motion sensors and they aim to further improve the user-friendly approach of the Watch’s features. This information was derived from a patent referring to “motion & gesture input”. This rumour was uncovered from the Apple World, and refers to “clenched fist”, as well as the “hand flap” gestures. Gesture controls operate on motion-based technology, and Apple states that they’re working in this field because of the situations in which the speaking ability of the user might be limited. The patent indicates that the new watch will presumably have multiple photodiodes, sensing the light from different positions. So how does this technology works? Basically, as the user performs hand gestures, his (or her) muscles will contract, sending positive information to the watch which will in turn perform a corresponding action. Negative information regards to “the open hand” where no gestures are performed, which will leave the watch on stand-by. No Apple watch so far was able to take actual photos and/or video calls, and it’s most likely that the Apple Watch from the series 4 won’t be able to as well. However, it could be used as a viewifinder which will help you take remote photos via your iPhone. There are rumours, though, that the newest Apple Watch 4 could utilize the camera feature with a special modular strap. In fact, rumours regarding previous releases were quite strong about camera module being introduced to Apple watch 2 and/or 3, so even if the 4 isn’t to take it, you can rest assured that it’s coming fairly soon. Basically, iPhone X features the Face ID, which means that Apple has perfected this form of technology. This was more than enough fuel for rumours that Face ID will come to Apple Watch 4, be it by means of integration or wearable feature (band). There are rumors based on Patently Apple’s report that Face ID feature will be included with the release of the new smartwatch, and it will come in form of a smart band. In essence, the band will feature a capacitive sensor and a face member, as well as several flex sensors on the elastic parts of the sides. Further rumors point out that EMG sensors will have a key role with the new Face ID feature. There are numerous Apple patents regarding this topic and the only thing that’s 100% positive is that this feature will be on-board the Apple Watch 4. Another sure thing is that the sensors will be included on the band’s inside, but what type will they be? Most patents indicate that the sensors will be EMG, Capacitance, Rigid, or Piezoelectric. Thousands, if not tens of thousands of people have called for an improvement in Apple Watch battery life, stating that this was the one of the most apparent (if not the only) flaws of such a perfect product. If you were among them, you should be pleased that the new Watch will “suffer” a significant boost to its battery lifetime. The report in January 2017 stated that Apple was focusing on improving the battery lifetime of Apple Watch 3, and it’s only logical to assume that they haven’t stopped, given that customers are still crying out. If Bloomberg report from 2017 is to be trusted, Apple worked on embedding the EKG technology into the watch (not via bands, but by means of internal integration). This might be true, however, let’s take a step back and remember the aforementioned FDA approval issue. As we already know, FDA approval (or disapproval, for that matter) is important to Apple, and it’s safe to assume that it was one of the most important reasons why they wanted to introduce the health bands. In conclusion, the EKG sensor is most likely to come, although we can’t say with certainty whether it will be with series 4 or 5. The WWDC 2018 announcement shows us that Apple Watch 4 (“the next watch”, as they cited) will come with pre-installed Watch OS 5 software. Simply put, the improved software means interface tweaks, as well as a broad range of brand new features. Apple referred to iOS 12 as “doubling down” in regard to performance boosts. This means that the apps are most likely to open twice as fast. Devices that will be compatible with iOS 12 are, basically, devices outfitted with iOS 11. The apple watch from the series 3 have shown a lot of promise, and it’s only normal that rumours about the newest Apple Watch 4 are so vivid (and most likely correct). Even though there are people who bash on Apple’s creativity, labelling them as “non-inventive” and “conservative”, the new watch release will prove a point, and that’s a promise. 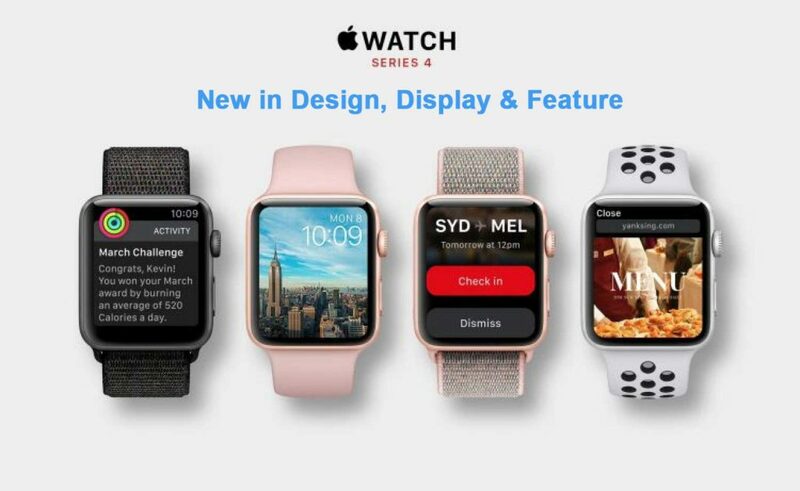 New design, display, plenty of improvements, as well as numerous brand-new features are heading our way with the release of the Apple Watch 4, and suffice to say – you should expect quite a lot from it.